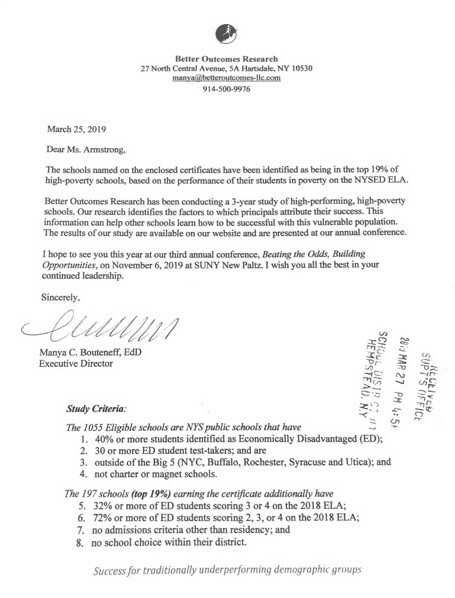 New York State Math Assessments will begin on Wednesday, May 1. School will be closed from April 18 - April 26 for Spring Break. School will reopen on Monday, April 29. After reading "Night of the Spadefoot Toads" by Bill Harley, Mr. Kemmet's 5th grade class went on a field trip to the Alley Pond Environmental Center to learn more about wetland environments and vernal pools. 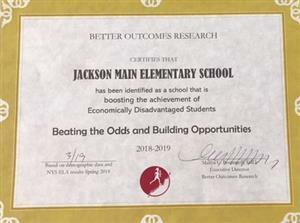 For the second year in a row, Jackson Main Elementary School was identified by "Better Outcomes Research" as a school that has been successful in "boosting the achievement of Economically Disadvantaged Students." During Media, Mrs. Truncale's class researched nutrition. They used their learning to create a healthy lunch. Click Transformations to read our newsletter. Parents please click REGISTER NOW to review the District's Technology Policy and register for your child to receive computer access and Microsoft Office licenses. Padres por favor haga click en REGISTRATE YA para revisar la poliza de Tecnologia del Distrito y registrarse para que su hijo(a) reciba acceso a las computadoras y licencias de Microsoft Office. 8:35 a.m. - 3:05 p.m.
January: Integrity, Independence, and Tolerance: Principled - I can tell the truth. I can do the right thing. I can be responsible for my words and actions. Risk-Taker - I have confidence to try new things. I stand up for things I believe in. February: Cooperation and Respect: Open-Minded - I can respect and learn from people who are different from me. March: Commitment: Balanced - I can get my mind and body ready for learning. I can take care of my body and be safe and healthy. April: Appreciation: Reflective - I can think about my learning, and know what I am good at, and what I need to work on. 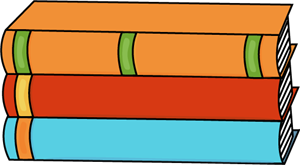 May: Preparation to showcase learning. June: Presentation of growth and development.